But this time it turned out quite cool. My work at Parleys.com allowed me to combine my private fun with work. For our publisher application we needed some functionality from my new RichFLV app mainly the speed and memory improvements. So I was able to work on it and most of all test it a bit more. I can not reveal much more before we present the publisher at Devoxx in Antwerp but it looks really cool. Here is a screenshot that reveals some of the new functionality. As a follow-up to a previous post i`ve posted a feature request for screensharing in the Flash Player/AIR bugbase. Enough noise! Let`s get visual! After the really great campaign “Adober, make some noise” by Andre Michelle, Joe Ebert and Kai-Philipp Schöllmann I think it is now time to look at long missed important update to the flash video capabilities. 1. Accessing raw video data . Accessing the bytes and setting the bytes of a video stream is really needed. Something similar to the new SampleDataEvent and extract methods of the Sound class. I would love to generate and manipulate videos in memory and give the resulting ByteArray directly to the Video object. Until now I have to load the flv twice, One time to load it as a Byte stream to manipulate the bytes and then another time to play it. There are hundreds of use cases for me. The two most important are: Video editors and dynamic language support for videos. So yes opening NetStream would be exactly what I need. 2. The second big feature I want in the Flash Player (or only AIR??) would be screen sharing. This is something that currently can exclusively be used by Adobe (see Connect) but is not accessible by the normal developers. This discussion is going on for years now and I think it`s finally time to come up with a solution. I know that one of the problems is that you need the connect addin but this should be solvable. I mean pacifica will also need an addin so why should this not wotk for screen sharing? Or even if they just enable it for AIR apps only I would be happy. Any news on these topics would be great! Come on germans go to MAX Milan! What`s this? Benelux leads in Max Milan registrations? What! – Meet the people that actually build the stuff that pay your Bill. This is my biggest point. It´s so cool to talk to the actual brains behind the products I use every day. I`m sure Adobe will ship some engineers from the headquarter over to Milan. – Meet other cool developers. Last year I met a lot of interesting people that i`m still in touch with and which just broadens your horizon. Something which is espacially important if you`re a freelancer which works on his own most of the time. – See the really really cool annoucements first. I`ve heard of some very cool stuff they are going to show. Some which might be quite unexpected. So no excuses – grab Serge Jespers discount code – convince your boss to get you a ticket and go there! This will just export your flv and remove all available sound tags. Get the latest RichFLV here. 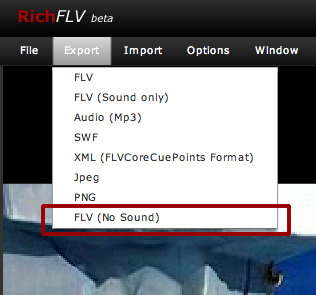 Again an update to RichFLV with some minor bug fixes. Some good news. While I don`t really work on the current RichFLV version anymore I spend some time to try other (better?) ways to do the flv manipulation. I have a prototype running that will not read all the data in memory. Other than I expected it`s pretty fast and memory consumption is low. Originally memory was no problem for me because RichFLV was meant to cut small flv files (around 50mb) but now I get more and more requests from people who want to cut flv files which are 500mb-1GB big. So with this new method i was able to cut an flv of 800mb and the memory stayed at 30mb throughout the whole process. So virtually any filesize should be possible. To make a working application out of this I will need to rewrite a lot of the old stuff and this will take some time – which I currently don`t have. So I plan to release a version of it which will have less features but enables you to work with pretty big files. So I would like to hear from you what are your favorite features. Leave a comment and I will try to add the most requersted ones first. In this session I want to cover aspects of working with files and streams in AIR and the Flash Player and take a look into how to manipulate those files by using the ByteArray class. Overview of how file manipulation/analyzation is used in the Parleys Publisher/Player. From there I extract some samples that will be discussed in detail (code). Sure it`s hard to cover all this in just 50 min but it`s meant to be an inspiring session which gives you an idea of the possibilities and to take away possible fear that this stuff is too difficult – it really isn`t! If the topic is interesting to you I would love you to register for it! Anyway I wish you all agreat MAX – and i´ll make sure I use my planned session material for some more blog posts. Just another bugfix for RichFLV which fixes a problem where the cue point data was not added to the onMetadata object. Parleys Share in beta – How about starting with Flex Frameworks? Here is the first beta of what is only the start of what we`ll introduce at parleys the next months. Now you can embed the talks in your own blog or website. We`re still testing the final bits so here is a talk from Jan Van Copenolle at Javapolis were he talks about Flex Frameworks and more check it out – and keep me busy by filing bugs and feature requests here.